I've sorted them based on length, longest to shortest. Only pure-breeds are mentioned for now, although there are mentions of half-breeds in Rowling's book. 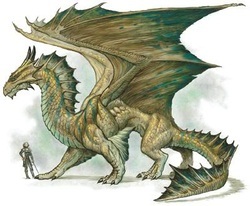 More Info: It is a bipedal breed with an immense wingspan, long talons and rough scales said to be as hard as steel. It is the largest breed of dragon. Sometimes the eyes seem to be the same color as its body because of a protective scale. 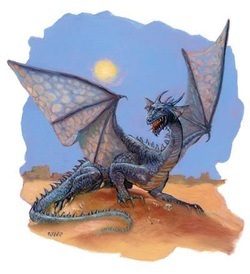 Rotund and slower in flight than other dragons, the Ironbelly is nevertheless extremely dangerous, capable of crushing dwellings on which it lands. Known Ironbellies: One of these guards the ancient family vaults in Gringotts. Length of average adult: 50 Feet. 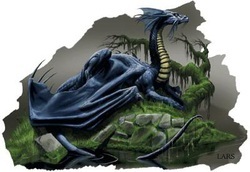 Appearance: Black scales, a spiked tail, and bronze horns protruding from its head. Egg Color: Cement-colored with very hard shells. Diet: Cattle, sheep, and goat. The eat humans as well, but don't prefer the taste. 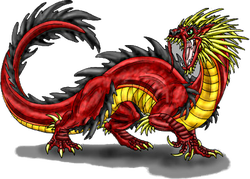 Extra: The Hungarian is considered to be the most dangerous dragon breed. Its roar is a yowling, screeching scream. The flames they breath have great range and are hot enough to start melting stone in seconds. Horntails are also known for being one of the most vicious breeds of dragon. They fly extremely fast and with great skill. Known Horntails: One of these was bought to Hogwarts in 1994 for the triwizard tournament from Romanian dragon reserves. Distinction: Very beautiful, its flames are a very vivid shade of scarlet. Egg Color: Pale grey, have been known to be mistaken by Muggles for fossils. Extra: It resides in valleys, which is unusual as dragons typically reside on mountains. 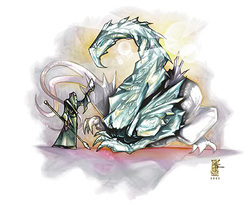 It is generally considered one of the most beautiful dragons and is not particularly aggressive, rarely killing unless it is hungry making it the easiest of dragons to train. Its prey of choice is sheep, but it has been known to attack larger animals. 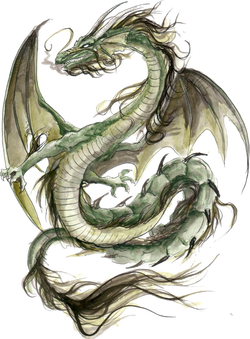 Appearance: Dark green scales, and two long, glittering golden horns. Extra: The Longhorn prefers to gore its prey with its horns before roasting it. The horns of the Longhorn, when powdered, are highly prized as a potion ingredient, and is a Class B tradeable Material. The Longhorn is seen as being very bulky and large despite being a fairly medium sized species of dragon they appear to have larger muscles. It is also the only dragon that has horns that go straight out like a bull.The native territory of the Longhorn has become home to the world's largest and most important dragon reservation. In recent years, the Longhorn has undergone an intensive breeding program after its numbers plummeted due to the demand for its horn. Distinction: Venomous Fangs, Most intelligent. Appearance: Black, very similar to Hungarian Horntail except for the ridges on its back. Diet: Large mammals, including water mammals, which is unusual for a dragon. 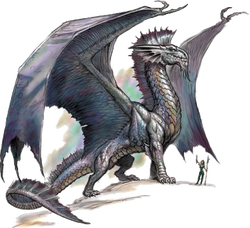 Extra: It resembles the Hungarian Horntail, except for its black ridges on its back, the browner texture in its scales, and its less hostile attitude. Female Ridgebacks are generally more ferocious than the males. Eye color: Bright purple or red. Appearance: Dark rough scales, ridges along its back, and a tail tipped with an arrow-shaped spike. Diet: Its favorite food is deer, although it has been known to carry off cows. 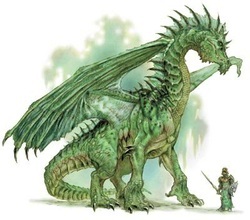 Extra: The Hebridean Black is more aggressive than the other dragon native to the British Isles, the Common Welsh Green, and thus requires a territory of one hundred square miles each. The MacFusty clan take responsibility for the dragons, and have done for centuries. Appearance: Scarlet and smooth scaled with a fringe of golden spikes around its face. Their snout is slightly short ending with a hooked beak on the top jaw. Egg Color: Crimson, speckled with gold, the shells are prized by Chinese Wizards. Diet: Mammals, preferably pigs and humans. More: Its name is derived from the mushroom-shaped flame that is emitted through its nostrils when angered, and its mouth when it roars or feels like burning something. Their females are generally larger than males. They're also mentioned to be very fast and clever, at least for a dragon. 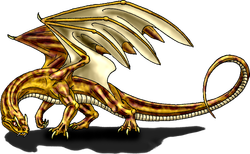 Unlike other dragons, the Fireball is more tolerant of its own kind, and will sometimes consent to sharing its territory with two other dragons. Distinction: Its flame is brilliant blue in color, and extremely hot, even in comparison to other dragons. Extra: Its attractive skin is much sought after for the making of gloves and shields. Since it rarely comes into contact with humans, the Short-Snout has less deaths to its name than most dragons. However, the Short-Snout is nevertheless one of the most dangerous species due to its agile flying and the extremely hot fire that it produces. The Short-Snout tends to be less agile on the ground because of its lack of forward limbs.The trophy awarded to the winner of the Annual Broom Race between Kopparberg and Arjeplog is designed after the Swedish Short-Snout. Egg Color: Earthy brown, flecked with green. Diet: Sheep and other small mammals, avoid human contact. Extra: It nests in the higher mountains regions where a reservation has been set up for it. This dragon is a relatively subdued breed. The Welsh Green's roar is rather distinctive and somewhat melodious and it issues its fire in narrow jets. Appearance: Smooth and copper-colored scales, black ridge-markings and short horns on its head. Diet: It feeds on goats and cows, but is notorious for its particular craving for humans. Extra: It is the smallest known breed of dragon and able to conceal itself well from Muggles. In the late 19th century, Vipertooth numbers once went on an alarming increase and became a serious threat to wizards and Muggles alike. The International Confederation of Wizards was forced to send an extermination squad in to reduce the Vipertooth population.